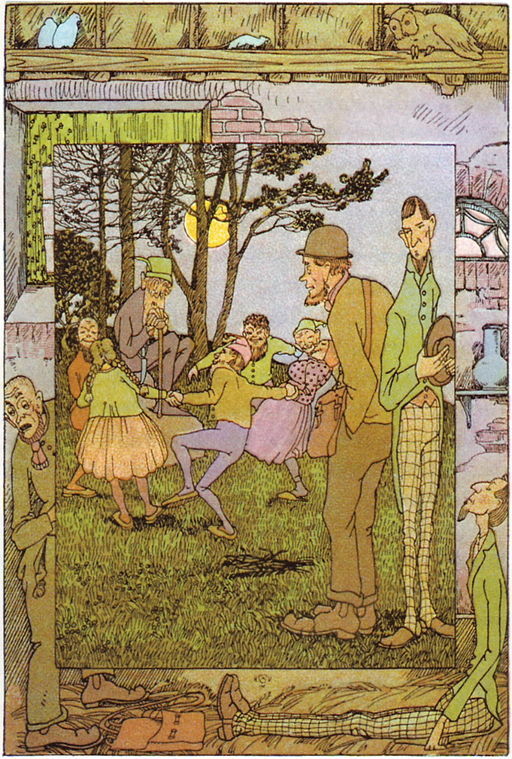 The illustration is by Heinrich Vogeler in the 1907 edition of Grimms' collection of fairy tales, Kinder- und Hausmärchen..
A tailor and a goldsmith were travelling together, and one evening when the sun had sunk behind the mountains, they heard the sound of distant music, which became more and more distinct. It sounded strange, but so pleasant that they forgot all their weariness and stepped quickly onwards. The moon had already arisen when they reached a hill on which they saw a crowd of little men and women, who had taken each other's hands, and were whirling round in the dance with the greatest pleasure and delight. They sang to it most charmingly, and that was the music which the travellers had heard. In the midst of them sat an old man who was rather taller than the rest. He wore a parti-coloured coat, and his iron-grey beard hung down over his breast. The two remained standing full of astonishment, and watched the dance. The old man made a sign that they should enter, and the little folks willingly opened their circle. The goldsmith, who had a hump, and like all hunchbacks was brave enough, stepped in; the tailor felt a little afraid at first, and held back, but when he saw how merrily all was going, he plucked up his courage, and followed. The circle closed again directly, and the little folks went on singing and dancing with the wildest leaps. The old man, however, took a large knife which hung to his girdle, whetted it, and when it was sufficiently sharpened, he looked round at the strangers. They were terrified, but they had not much time for reflection, for the old man seized the goldsmith and with the greatest speed, shaved the hair of his head clean off, and then the same thing happened to the tailor. But their fear left them when, after he had finished his work, the old man clapped them both on the shoulder in a friendly manner, as much as to say, they had behaved well to let all that be done to them willingly, and without any struggle. He pointed with his finger to a heap of coals which lay at one side, and signified to the travellers by his gestures that they were to fill their pockets with them. Both of them obeyed, although they did not know of what use the coals would be to them, and then they went on their way to seek a shelter for the night. When they had got into the valley, the clock of the neighbouring monastery struck twelve, and the song ceased. In a moment all had vanished, and the hill lay in solitude in the moonlight. The two travellers found an inn, and covered themselves up on their straw-beds with their coats, but in their weariness forgot to take the coals out of them before doing so. A heavy weight on their limbs awakened them earlier than usual. They felt in the pockets, and could not believe their eyes when they saw that they were not filled with coals, but with pure gold; happily, too, the hair of their heads and beards was there again as thick as ever. They had now become rich folks, but the goldsmith, who, in accordance with his greedy disposition, had filled his pockets better, was as rich again as the tailor. A greedy man, even if he has much, still wishes to have more, so the goldsmith proposed to the tailor that they should wait another day, and go out again in the evening in order to bring back still greater treasures from the old man on the hill. The tailor refused, and said, "I have enough and am content; now I shall be a master, and marry my dear object (for so he called his sweetheart), and I am a happy man." But he stayed another day to please him. In the evening the goldsmith hung a couple of bags over his shoulders that he might be able to stow away a great deal, and took the road to the hill. He found, as on the night before, the little folks at their singing and dancing, and the old man again shaved him clean, and signed to him to take some coal away with him. He was not slow about sticking as much into his bags as would go, went back quite delighted, and covered himself over with his coat. "Even if the gold does weigh heavily," said he, "I will gladly bear that," and at last he fell asleep with the sweet anticipation of waking in the morning an enormously rich man. When he opened his eyes, he got up in haste to examine his pockets, but how amazed he was when he drew nothing out of them but black coals, and that howsoever often he put his hands in them. "The gold I got the night before is still there for me," thought he, and went and brought it out, but how shocked he was when he saw that it likewise had again turned into coal. He smote his forehead with his dusty black hand, and then he felt that his whole head was bald and smooth, as was also the place where his beard should have been. But his misfortunes were not yet over; he now remarked for the first time that in addition to the hump on his back, a second, just as large, had grown in front on his breast. Then he recognized the punishment of his greediness, and began to weep aloud. The good tailor, who was wakened by this, comforted the unhappy fellow as well as he could, and said, "Thou hast been my comrade in my travelling time; thou shalt stay with me and share in my wealth." He kept his word, but the poor goldsmith was obliged to carry the two humps as long as he lived, and to cover his bald head with a cap. Add The Little Folks' Presents to your own personal library.